Business School is a self-help book that talks about the Multi-Level Marketing business model. 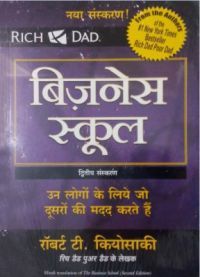 The book has been translated into Hindi from its original English version, and comes with an Audio CD. It highlights the eight values of a network marketing business, and emphasises on the usefulness and necessity of â€˜networksâ€™ in order to be successful. It also points out the people at the top of a network marketing business, who dispense such advice, are there because they have succeeded in the real world â€" unlike business school lecturers. The book also spells out the difference between being an employee/self-employed and being a business owner/investor. It talks about the need to change from one side to the other in order to strike it rich, and provides insights on how this can be done. Robert T. Kiyosaki is a fourth generation Japanese-American businessman, investor, speaker, and author. His very first book Rich Dad Poor Dad was on The New York Times and The Wall Street Journal best-seller lists. He has written as many as 15 books. A staunch believer in the network marketing concept, he has also created games for people to understand their investments better.